For me, getting ready to go anywhere is pretty low maintenance. I can’t stand sitting in front of the mirror for hours doing my makeup and curling my hair, so I simply don’t. That being said, I have developed a bit of a routine when I get ready and while it’s nothing fancy, it works for me. Its starts with hair. If I’m doing anything to my hair, I get hot, so I like to finish this step before I put on my outfit or makeup. I usually blow dry and straighten it (occasionally I’ll curl it) or let it air dry. I told you guys — low maintenance. Next is makeup. I’m pretty minimal with makeup and rely on Bare Minerals Complexion Rescue and Powder, Nars Blush, Laura Mercier eye liner, Bare Minerals mascara, Glossier balm dotcom and then lip color — lately I’ve been wearing this Kevin Aucoin gloss that I wore at my wedding last summer. After that, I’ll get dressed. The last step in my routine is the easiest of them all, but one I don’t like leaving home without, and that’s perfume. I like to think of it as the finishing touch to an outfit. It’s the one thing that leaves me feeling confident, fresh and totally ready to walk out the door. 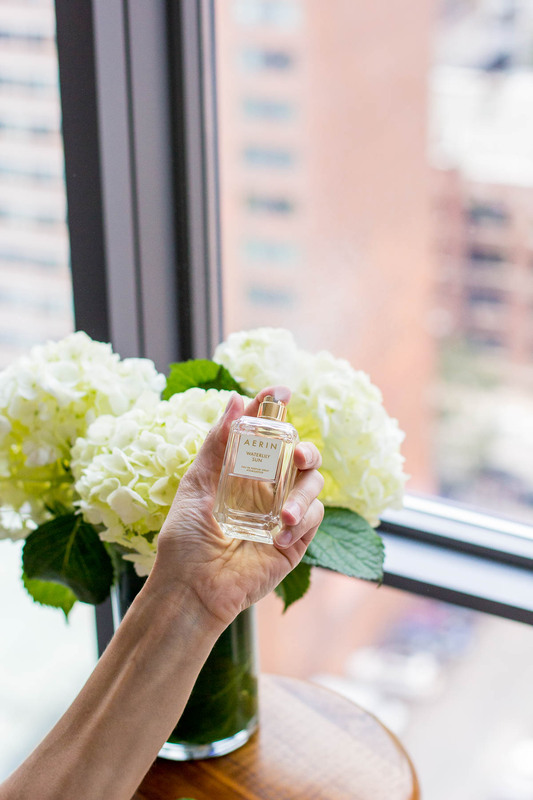 I was recently introduced to the AERIN line of fragrances and since then, I’ve fallen in love with their fresh scents. Did you know Aerin is the granddaughter of Estée Lauder? It makes sense why all her beauty products are amazing. It was tough to pick a favorite between the AERIN fragrances. All of them were fabulous, delicious even! Is that a weird way to describe perfume? I settled on Waterlily Sun as my favorite (at least for now) because of its light, fresh and feminine scent. Plus, it reminds me of summer and who doesn’t want that?! If you’re like me and judge things at first glance, you’re going to love these even more. The packaging is young, modern and whimsical and covered in gorgeous, eye-catching patterns. The bottles themselves are beautiful too. They’re elegant, but fun and I love the pop of green the top of the Waterlily Sun bottle brings to my dresser (each scent has a different color). I’m thinking these would make for fun bridesmaid gifts or birthday gifts for my girl friends too! With a spritz on my wrists and neck, I’m ready for the night out or even a day at work! It’s a simple routine, but a routine nonetheless and the final step is always the one that makes me feel extra beautiful and feminine. What’s the finishing touch to your getting ready routine? This post was sponsored by AERIN. Thank you for supporting the brands that keep The Fox & She up and running. As always all opinions are my own!